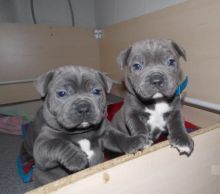 Solid blue Staffordshire bull terrier puppies for sale.We are committed to loving & breeding high quality healthy happy puppies/dogs. We work really hard with our dogs & puppies to ensure they are really well socialised with adults our five young children who play with them every day and other dogs/puppies as possible, we also introduce them to a wide range of events, environments and situations that they are most likely to encounter in normal day to day life, To ensure they are full of confidence ready to go to their new loving homes. All our adult dogs are vet checked every year to ensure they are healthy, our puppies are also vet checked, vaccinated wormed at the correct age & microchipped and fully toilet trained,We have a male and a female left, so if interested. Text On ( 204) 817-5731 ) Or E mail me on (paulhulk789@gmail.com )If really interested.